It’s been awhile since I’ve cooked a gourmet meal at home and my recent visits to numerous innovative restaurants inspired me to get back into the kitchen. I decided to do a four course New American/Italian inspired dinner including an antipasto (appetizer), primo (pasta, rice, or gnocchi), secondo (main course), and dolce (dessert). I did some brainstorming the night before on what ingredients I wanted to use and what’s in season. March is considered an in between month for vegetables and fruit so I have the availability of both winter and spring produce. All the dishes I created I came up on my own. Antipasto: Cauliflower Soup with Braised and Roasted Brassicas, Pickled Radishes, Brown Butter Hazelnuts, and Parsnip Chips. Recently, I’ve been seeing the word “brassicas” on menus at many restaurants. This term is used for a category of vegetables including cauliflower, broccoli, brussel sprouts, cabbages, collard greens, kohlrabi, and rutabaga, just to name a few. I cooked the cauliflower with water and cream until tender and then blended it with some butter and seasoned it to taste. 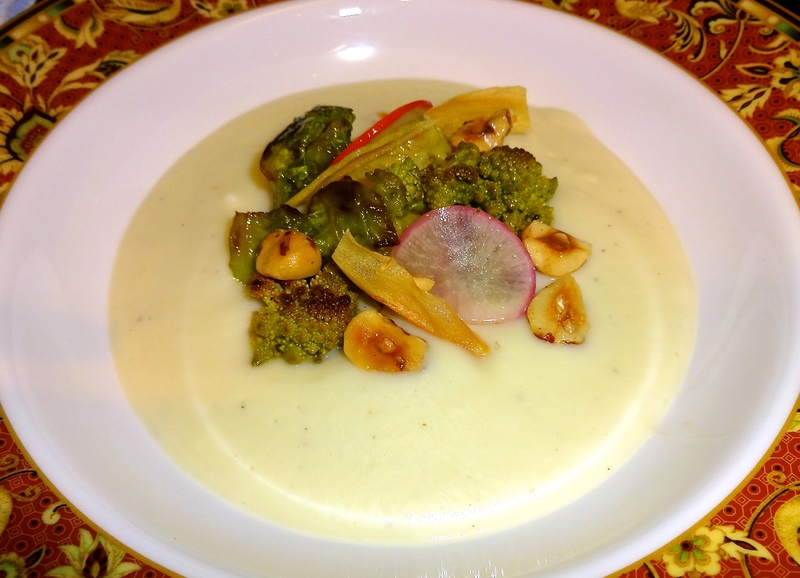 I garnished the soup with roasted romanesco broccoli, braised savoy cabbage, pickled radishes (simple pickling solution of apple cider vinegar and sugar), brown butter hazelnuts, and parsnip chips (simply fried in vegetable oil). 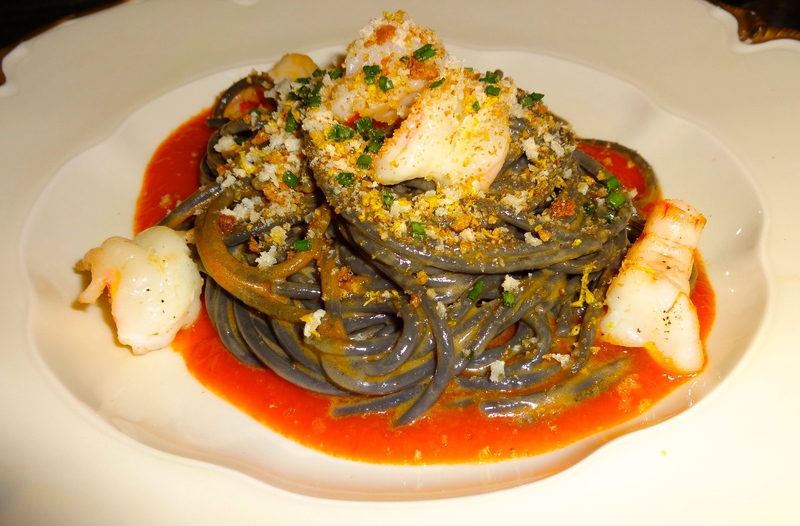 Primo: Squid Ink Spaghetti tossed in Shrimp Butter with Florida Pink Hoppers, Chili San Marzano Tomato Sauce, and Lemon and Chive Breadcrumbs. I didn’t feel like making the pasta from scratch since I was already cooking multiple courses and I knew Market Hall’s pasta shop has amazing quality pastas. I made the shrimp butter by sautéing a mirepoix (onion, celery, and carrot) until slightly browned, then added the shrimp shells, and toasted them until slightly brown. Then, I added tomato paste and cooked it with the aromatics for a minute before I added water. I let this mixture cook for about 30-45 minutes adding water occasionally. Eventually, I strained the solids from the liquid and added the infused liquid to softened butter. Once incorporating the shrimp liquid with the butter I put it in the refrigerator to harden. The chili tomato sauce was a simple sauce made from onions, garlic, Thai red chili pepper, and canned San Marzano tomatoes. Usually, canned tomatoes can be slightly acidic but San Marzano tomatoes are naturally so sweet! I highly recommend buying canned San Marzano tomatoes to see the difference in making a delicious tomato sauce. I topped off the pasta with lemon zest, chives, and breadcrumbs that I made from just drying out bread in the oven and putting it in the food processor. Shrimp Stock in the Works. 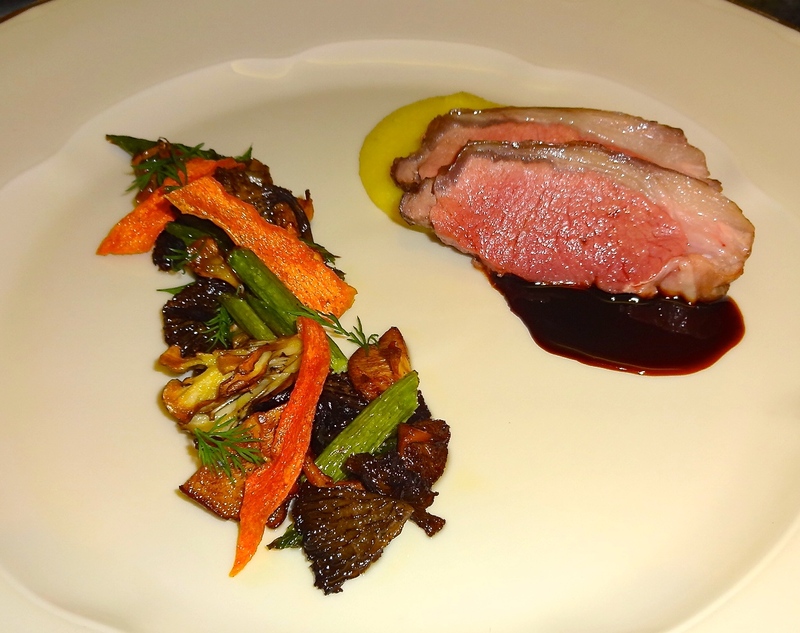 Secondo: Roasted Lamb Loin with Green Garlic Polenta, Roasted Asparagus and Mushrooms, Carrot Chips, Dill, and Demi-Glace. I rarely cook with lamb and I thought it would be a great alternative to the usual beef, pork, or chicken options. For the polenta (Italian cornmeal), I added a purée of green garlic, young garlic before it matures, to give it a slight pungent flavor. I used three types of mushrooms for the dish: hedgehog, maitake, and yellow foot which I roasted in the oven with fresh thyme. I wanted to use asparagus in the dish since it’s in season and I added the carrot chips (simply fried in vegetable oil) for some sweetness and crunch. I also garnished the dish with some fresh dill to give a herbaceous note. Luckily, I was able to buy demi-glace from Market Hall since making it at home is a long process. Dolce: Rhubarb and Strawberry Compote with Greek Yogurt, Fresh Strawberries, and Pistachios. As much as I love to eat desserts now, it’s still not my strong suit when it comes to cooking. Since I was already making an extravagant meal, I wanted a simple dessert that was fast and easy. 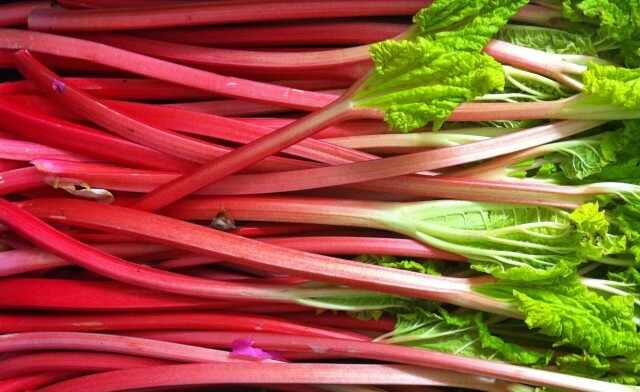 For the compote, I diced the rhubarb and strawberries and cooked them with sugar, vanilla, and a splash of water until the fruit broke down (be careful, rhubarb cooks extremely quickly and can become mushy). I added a drizzle of honey into the Greek yogurt to sweeten it up. 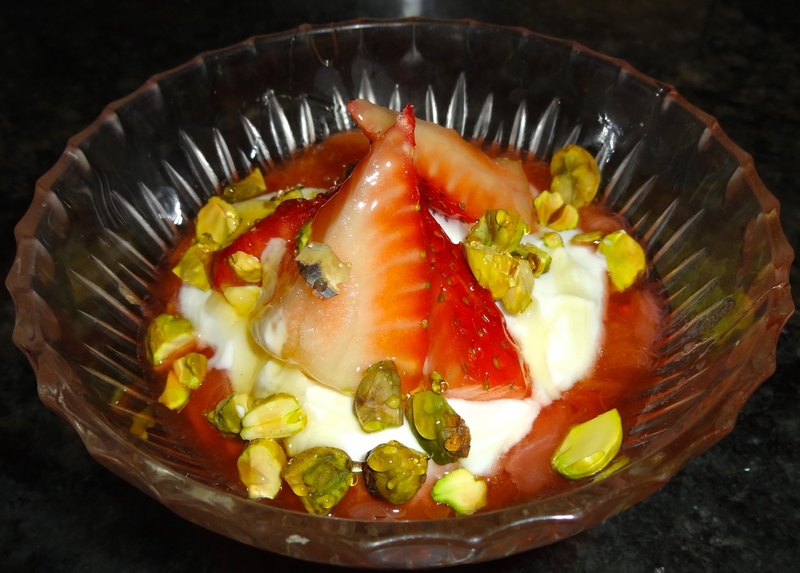 To assemble the dessert, I started with the compote, then added the Greek yogurt, and topped it off with fresh strawberries and chopped pistachios. As you can tell, none of my creations are traditional Italian dishes but take inspiration from Italian flavors and incorporate them into my interpretation of Californian cuisine. Perhaps next time I’ll cook a multi course traditional Italian menu! Wow, Ness!! So beautiful, and delicious no doubt.